First quarter of 2017 was full of updates for all major products of our company. NAB Show 2017 this April. If you'd like to meet us and talk about our products, plans or anything around - just drop us a note so we could schedule proper time slot. 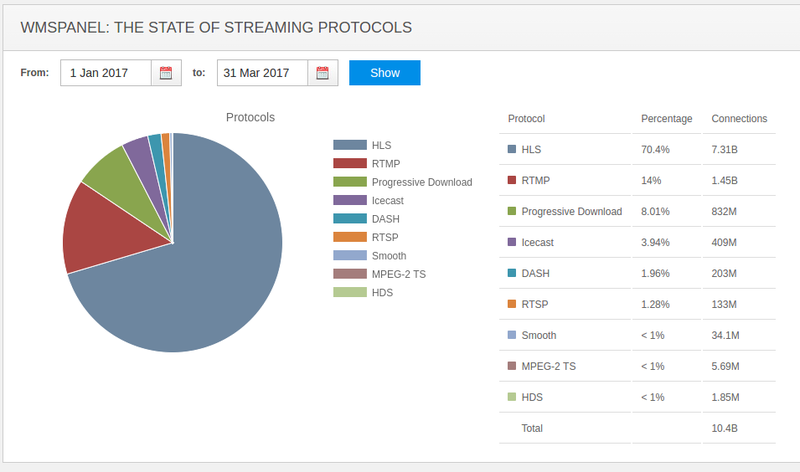 Also, check out the State of Streaming Protocols for Q1 of 2017 is available with MPEG-DASH going up. Our software media server and its transcoder got a number of important updates. Speaking of hardware, we ran an extensive testing of latest NVidia Tesla M60 graphic card in IBM Bluemix Cloud Platform to see how much it increases the performance of Live Transcoder for Nimble Streamer. We got excellent results, read this article for full details. Video and audio can also be binded together in case they come from un-synced sources. Read this article for details. Those un-synced sources may be video and audio files - our transcoder is now capable of producing live streams from them. Same article describes how this can be done. You can also check our videos which illustrate this process. CEA-708 subtitles forwarding is now available in Nimble Streamer for both transmuxing and transcoding. Handling live streams timing errors compensation for DVR was added as well. RTSP can now be take over HTTP using VAPIX. MPEG-TS processing was enhanced by adding mux rate. We've also added a brief troubleshooting section in the corresponding article to make sure our customers can overcome typical issues related to UDP delivery. Read this article for more details. ASN viewers count metric is now available in WMSPanel. It will be useful for those companies that want to build delivery networks with better latency and user experience. Mobile SDK have continuously been improved. You can find all latest versions' descriptions in SDK release notes. Multiple connections streaming. You can add several connections profiles and choose up to 3 connections for simultaneous streaming. You can stream to several destinations like your primary and secondary origin servers and also target it to some third-party service like YouTube Live or Twitch. Limelight authentication is available. You can publish your streams directly into Limelight CDN for further delivery. Streaming and user experience improvements. We've added various updates to Windows Phone application to make it up-to-date with the fixes on other platforms. As always you can find the latest releases of Larix Broadcaster streaming app in AppStore, Google Play and Windows Store. The next quarter will bring more features so stay tuned. Follow us at Facebook, Twitter or Google+ to get latest news and updates of our products and services. First quarter of 2017 has passed so let's take a look at stats. The media servers connected to WMSPanel processed more than 10 billion connections from 3300+ media servers (operated by Nimble Streamer and Wowza) during past 3 months. In the 4th quarter of 2016 it had being collected from 3200+ servers. HLS is still stable at ~3/4 of all connections, its share is 70%. RTMP is at the same level and even increased its share to 12%. Low latency streaming use case still need this protocol. Progressive download is 3rd popular at 6%. MPEG-DASH overcame HDS, Icecast and MPEG-TS going up by nearly 3 times by views count - it's now 5th popular protocol. RTSP and Icecast kept their shares. So MPEG-DASH is the only protocol which was visibly improving. You can also check December summary of steaming protocols. We'll keep analyzing protocols to see the dynamics. Check our updates at Facebook, Twitter or Google+. Video Acceleration API (VA API) is a royalty-free API along with its implementation as free and open-source library (libVA). This API provides access to hardware-accelerated video processing, using hardware such as graphics processing units (GPU) to accelerate video encoding and decoding by offloading processing from CPU. Supported codecs are H.264 and VP8. Nimble Streamer supports VAAPI and allows using libVA in Live Transcoder as one of the options for encoding among other libraries and SDKs. Let's see how you can start using libVA in Nimble Streamer Live Transcoder. Nimble Streamer media server is being developed as a native application for all popular platforms. You can see this in the full list of supported OSes. It also supports basic architectures available at the majority of hosting providers. Today we add support for a new platform, POWER8 by IBM, a family of symmetric multiprocessors. Both Nimble Streamer and Live Transcoder were ported so you can use full capabilities of our products on this platform, including live streaming, VOD, DVR and build delivery networks of any kind. Check installation instructions for Ubuntu to proceed with deployment. Only Ubuntu 14.04 is currently supported at the moment. Nimble Streamer can be potentially ported and embedded to any platform or OS, so feel free to contact us in case you have some special cases.